One of the few painters in Impressionist style in Kentucky at the turn of the 19th to 20th centuries, Paul Sawyier was born at Table Rock in Madison County, Ohio on March 23, 1865, on his Grandfather Sawyier's farm. When he was five years old, his parents, Dr. Nathaniel and Ellen Wingate Sawyier, moved with their four children to Frankfort, Kentucky. The family lived with Ellen's mother, Mrs. Penelope Anderson Wingate, who resided on Broadway across from the L&N Railroad Depot. Paul Sawyier's artistic talent became apparent during his early years. His father had an art tutor come to the Sawyier home for Paul and his sister, Natalie. At the age of 19, in 1884, Sawyier studied portraiture under Thomas S. Noble at the Cincinnati Art Academy. After the Academy, Paul briefly held a job as a hemp salesman, but the pull of art proved irresistible. Sawyier went to New York City for further training at the Art Student's League. In 1889 and 1890, he studied under William Merritt Chase and was able to observe the famous portrait painter John Singer Sargent. In 1890, Sawyier studied for a year under Frank Duveneck, in Covington, Kentucky, who was at the height of his national fame as an oil portrait painter. Chase and Duveneck were friends and had painted together in Europe. After his studies were completed in New York and Covington, Sawyier returned to Frankfort. He made a living primarily by painting portraits of members of well-to-do families in the community. He also started to paint scenes of Elkhorn Creek and the Kentucky River. In 1887, at the age of 22, Sawyier met Mary "Mayme" Bull (1865-1914) of Frankfort and they became formally engaged. Because of a mutual desire to take care of their ailing parents and Sawyier's struggle to financially survive as an artist, they never married. Sawyier's sisters burned all correspondence between Mayme and Paul after his death destroying all intimate details of their relationship. In 1893, Sawyier went to the Chicago World's Fair Colombian Exhibition where some of his works were in the State of Kentucky display. It was at this exhibition that Impressionism was formally introduced in the United States, and Sawyier, influenced to become an "American Impressionist" became one of the few proponents of Impressionism in Kentucky. He also found his first taste of real popularity in 1893. A covered bridge he had captured in a series of copperplate etchings was closed, and suddenly those etchings were much in demand. By 1901, Sawyier's parents were both in ill health. Paul's sisters had married, and his brother had moved to Mississippi. Paul took charge of caring for his parents and they moved into the old parsonage of the First Baptist Church. After the death of his mother in 1908, and with his father in a Louisville nursing home, Sawyier decided to fulfill his dream of living on a houseboat, painting scenes of the Kentucky River. He spent the next five years, between 1908 and 1913, on the river, mainly between Shakertown and Camp Nelson, moving up and down the river. It has been estimated that C.F. Brower & Company of Lexington, sold over 500 of Sawyier's watercolors between 1908 and 1910. Sawyier moved to Brooklyn, New York in 1913, trying to find a new market. 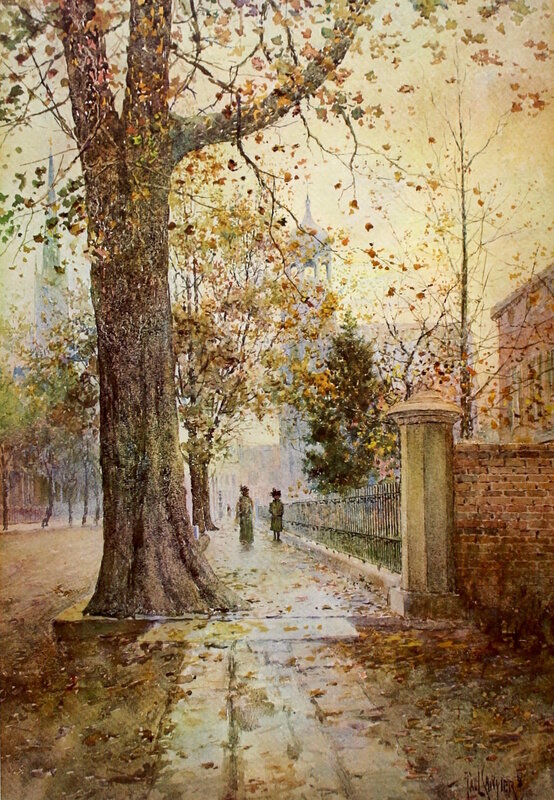 While living with his sister, Lillian, he spent two years painting scenes in the beautiful parks of the area. It was also during this time that Sawyier, for unknown reasons, changed his signature. In 1915, Sawyier moved from Brooklyn to the Catskill Mountains. He initially lived in High Mount, New York, painting in both oils and watercolors. While concentrating on scenes of the Catskills, Sawyier would also work from photographs and paint Frankfort and Kentucky River scenes. He often sent these back to buyers in Kentucky. After a time, Sawyier moved a short distance to Fleischmanns, New York to live with the Phillip F. Schaefer family. Mr. Schaefer was a local merchant and amateur painter. Sawyier died of a heart attack in the Schaefer home on November 8, 1917 at the age of 52. He was buried in the nearby Covesville, New York Cemetery. In 1923 Sawyier's cousin, Judge Russell W. McReary brought Sawyier's body back to Frankfort. He was buried in the Sawyier-Wingate family plot in the Frankfort City Cemetery. During the period from 1887 to 1917 it is estimated that Paul Sawyier painted over 3,000 works. 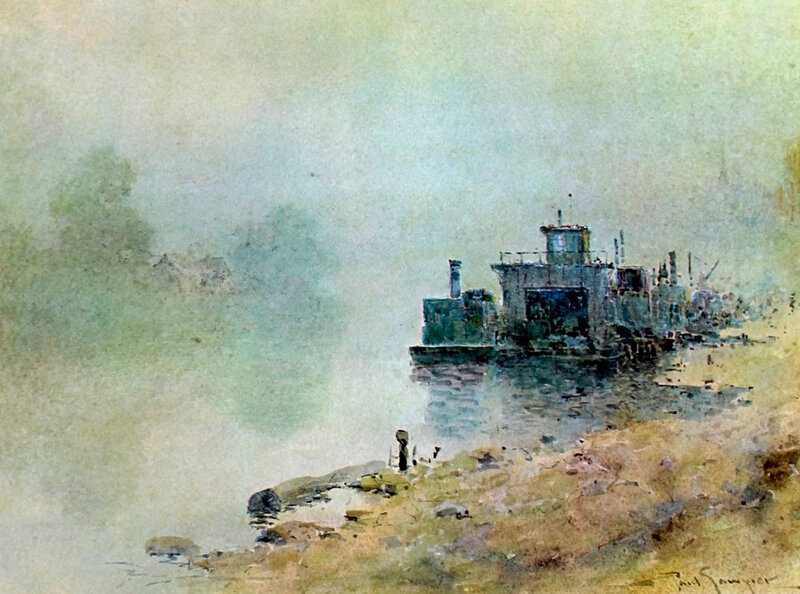 He primarily painted scenes of the Elkhorn Creek, Kentucky River and Frankfort in watercolors. Most of his portraits, estimated to be about 100, were in either oil or pastel. Sawyier painted about 200 oils, almost all after moving to New York. Many thumbnail sketches have been found but most of his oils, while not large, were bigger, either about 13 x 16 or 20 x 24 in size. Today about 1,500 of Sawyier's originals have been found or accounted for. Familiar paintings include "The Fountain in the Rain," "Wilson Store at Keene," "Old Capitol Hotel in the Rain," "Wapping Street," and "Pastoral Scene of Sheep in the Lane." Of Sawyier's three sisters and brother, only Lillian had children; however, her twin sons never married or had children. Therefore, there are no direct descendants of the Nathaniel and Ellen Wingate Sawyier family, and it is a mystery what happened to the family's original paintings. Since 1940, Sawyier exhibits have been held at Eastern Kentucky University, Maysville Museum, Georgetown College, University of Kentucky, Kentucky Historical Society, Paul Sawyier Galleries, Inc. (Frankfurt, Kentucky), and twice at the J.B. Speed Museum and Shakertown Village. Four volumes have been written about Sawyier's life and works. These books are all based on the research of historian Dr. W. R. Jillson, who in the late 1930's, talked with surviving Sawyier family members and any individuals who personally knew Paul Sawyier. Since 1968, over 300 of Sawyier's original paintings have been reproduced as limited edition art prints.